There were two special trees dedicated recently. They were already in the ground, one planted last year and one planted a week earlier. These were planted for loved ones and dedicated by families and friends. On a Sunday a family came to Cannon Hill Park to dedicate the tree for their patriarch. The tree had come through a tough start and we wondered if it was going to survive but was now flourishing. His daughter tearfully talked about her father and I could feel the love and respect this family had for him. Then things got more lighthearted. 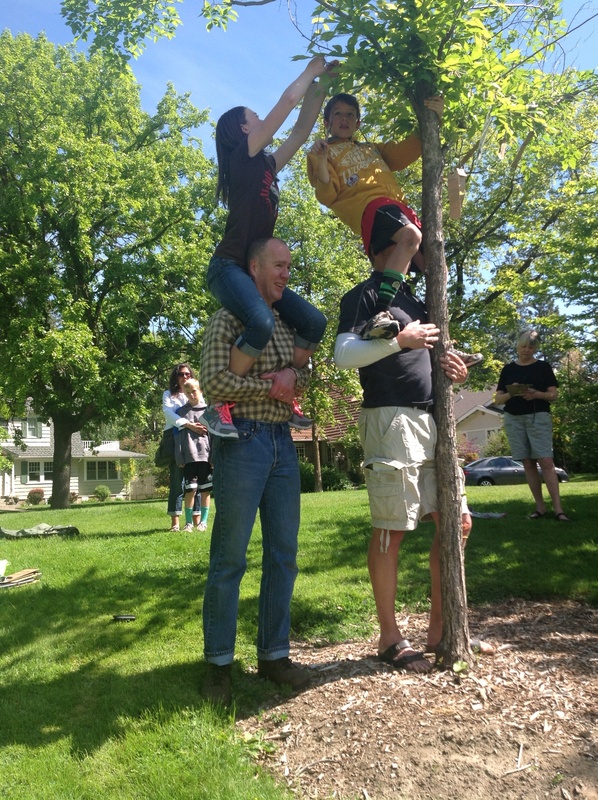 We wrote tree-grams but in order to get them hung in the very high branches, the children had to ride on the shoulders and head of the tallest family members. 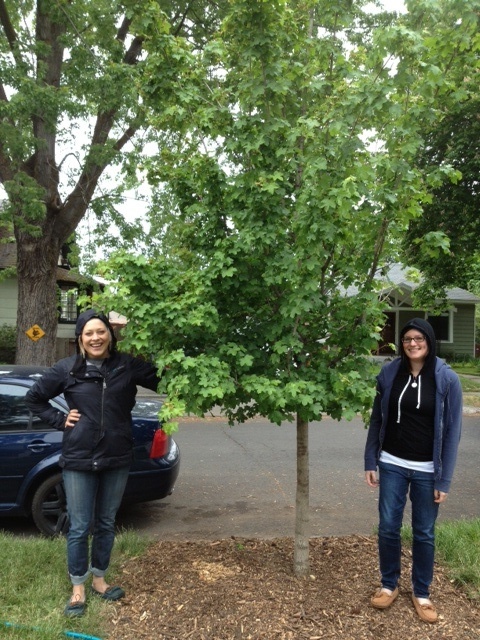 Monday’s tree was a street tree planted in front of a rental house. The current occupants wanted to honor a former housemate who was killed a year ago in a car crash. We sat on the front porch and talked about Susie and Lyle. One of his friends had tried not to even think about him for the last year but now was ready to share stories of him. They kept extra tree-grams so that family and other friends could come and write memories of him to hang in the tree. It would be a chance for all of them to talk about Lyle and to keep his memory fresh and alive. I love dedicating trees as memorials. I always tell Susie’s story and then I ask the others at the planting to tell me about the one they lost. There are laughter and tears and then pictures and stories. So many people are afraid to ask about people who have died and families are afraid to talk about their loved ones. There seems to be a fear of bringing up emotions and perhaps causing tears, but crying is OK. Eleven years after Susie’s death I still cry, but I feel I need to keep her out in the world where she should be and so I talk about her often. And I think that talking about Susie at a tree planting gives others permission to bring their loved ones back into the world. And I hope that that they can come to their tree and find the spirit of their loved one.